Italian builder Otam has announced the sale of its fourth semi-custom 25.5 metre 80 HT Millennium hull with Stephan Dahm at Yacht Trading Ibiza introducing the buyer. Construction began without a commission, and the latest hull in the series maintains all of the technical advantages of its predecessors, including the deep-V hull that helps to deliver a top speed of almost 50 knots. The Italian yard’s decision to build on spec was influenced by a high number of requests and ongoing negotiations. Additionally, with the hull already under construction, any potential owner will be able to enjoy quicker delivery without having to compromise on customisation. As with the other models in the Millennium range, the hull is being built using a blend of vinylester resin and Aramat, a special combination material in which the glass fibre is interwoven with Kevlar. Twin MTU M94 engines deliver 2,600hp and combine with Arneson 15A1L jet drives to propel the yacht to its impressive top speed of 48 knots. 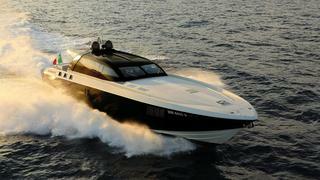 The 80 HT Millennium has accommodation for six guests in three VIP cabins, as well as two crew cabins. According to a statement from the yard, the deep-V hull provides “soft and fluid behaviour through the waves”, cruising at 38 knots in complete safety, even in rough seas. Otam draws on more than 60 years of powerboat experience to offer seven models in the Millennium range, including the largest model, the 30.48 metre Millennium 100. 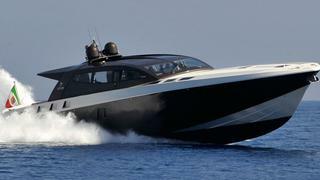 Otam has also suggested it intends to build an open version of the Millennium 80, designed as a superyacht chase boat. The Italian yard revealed in 2014 that it was to begin production of aluminium semi-displacement yachts from 30 to 40 metres. Production of the first Otam SD 35, Gipsy, is well underway, with delivery scheduled for June 2016.